Buffalo, NY, April 4, 2013 - On April 27, 2013 — the 6th National Prescription Drug Take Back Day — drugstores, police departments and other locations nationwide will accept unwanted or unused prescription drugs. 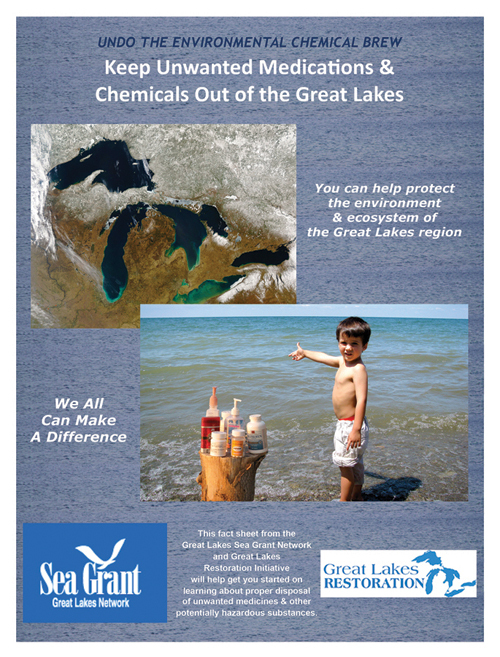 In New York State, New York Sea Grant is encouraging people to participate in this opportunity to properly dispose of the unwanted and unused medicines, including veterinary drugs, to help keep pharmaceuticals out of the Great Lakes. “We want people to stop flushing them down the toilet or the drain,” says New York Sea Grant Coastal Education Specialist Helen Domske, Buffalo, NY. Domske is the author of the “Undo the Environmental Chemical Brew: Keep Unwanted Medications & Chemicals Out of the Great Lakes” fact sheet, co-published by the New York, Illinois-Indiana, Ohio and Pennsylvania Sea Grant programs, to help consumers learn how to properly keep pharmaceuticals and personal care products (PCPs) out of surface waters and why it is critical to do so. The fact sheet is online at www.nyseagrant.org/unwantedmeds. National Prescription Drug Take Back Day collection site locations are found online at http://www.deadiversion.usdoj.gov/drug_disposal/takeback.